It was a big day in the stuido this week! 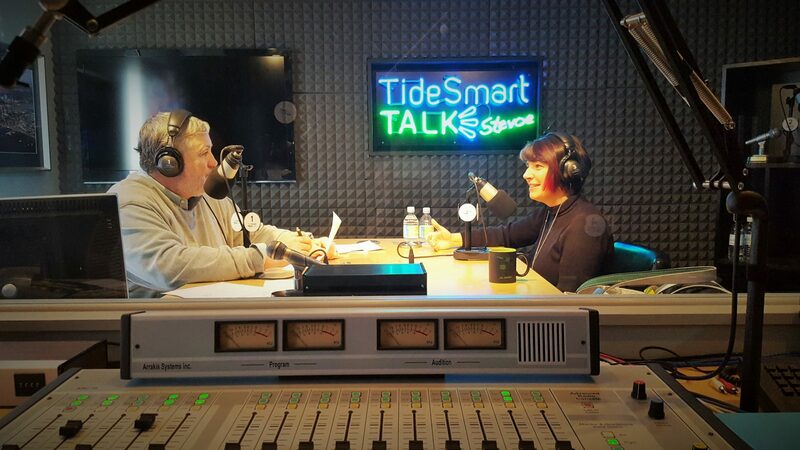 Our interview with Dr. Aileen Yingst marks our 200th episode of TideSmart Talk with Stevoe. In the four years, ten months, and three weeks that we have been on the air Stevoe has talked with over 263 individual guests coming from an extensive range of backgrounds. We have welcomed governors, senators, Olympians, college presidents, Nobel prize winners, NASCAR drivers, celebrity chefs, authors, and presidential candidates to our show. We have come a long way since the very first episode where we talked with The Amazing Kreskin and lawyer F. Lee Bailey on 03 March 2012. Thank you, thank you, thank you to our listeners – we’re looking forward to another 200 shows that are as entertaining as they are informative. Please read on to hear about our special guest, Dr. Aileen Yingst of the Planetary Science Institute. Cheers! Host of TideSmart Talk with Stevoe, Steve Woods, welcomed Dr. Aileen Yingst, Senior Scientist with the Planetary Science Institute (at right). Aileen Yingst is a southwest Michigan native and a graduate of Dartmouth and Brown and is one of the lucky ones who had “a calling” and has known it her whole life. For as long as she can remember, Yingst has wanted to be a space scientist. She was(and still is) a Star Trek fan who would be disappointed when Sunday night football ran long and she was unable to watch the show; She claims she’s only been star struck once – when meeting Levar Burton, who was equally impressed with Yingst after learning she actually works for NASA, kind of. Yingst is actually employed by the Planetary Science Institute (PSI), a non-profit company with the goal of exploring the Solar System. While PSI is technically headquartered in Tuscon, Arizona, they pride themselves on hiring Space Scientists who are capable of working anywhere in the world – which is how Yingst ended up in Brunswick, Maine. From her home office, or kitchen counter, or comfort of her couch, she is able to do her work: taking and examining photographs from the Curiosity Mars rover. When NASA sets out their plans or goals, companies like PSI can bid on the work and contract with NASA. For other projects, staff scientists can submit their proposals for grant money and still work for PSI. Yingst and her team are currently responsible for planning Curiosity’s movements one sol ahead of time (a sol is the name for a “day” on Mars). It takes about 20 minutes to send instruction to Mars and another 20 minutes to receive feedback, so the PSI team plans the whole sol at once and waits to see what comes back when the rover has the chance to pass information to an orbiting relay station. The most important information the team has discovered recently is evidenced in photographs Yingst believes could have once been a lake or waterway. She says Mars is fairly similar to Earth, but they are working to determine what happened on that planet to make it inhabitable. She is looking forward to 2020 when NASA will launch the newest rover with the intention of taking and storing samples from Mars. To view the same photos Yingst studies from Curiosity, visit JPL.NASA.gov. To learn more about Dr. Yingst and PSI’s work, please visit psi.edu and listen to the interview below. Posted on Monday, February 6th, 2017 and filed under Show Recaps.